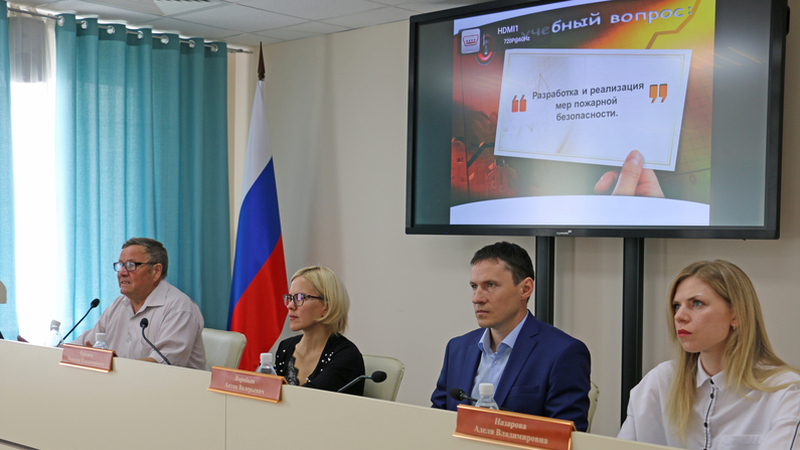 On May 24, 2018, in the Ministry of Justice of the Republic of Tatarstan, for the chairmanship of Deputy Minister N.V. Ragozina, training was held in video conferencing for the justices of the peace on the topic: «On fire safety measures in the buildings and premises of judicial sectors of the justices of the peace of the Republic of Tatarstan». The lecture was read by N.D. Dolgov, teacher of the training and methodological center for civil defense and emergency situations of the Republic of Tatarstan. The event was attended by A. Vorobyov, head of the activity assurance department of Justice of the Peace, A. Nazarova, head of the department of organizational and legal support of Justices of the Peace, A. Safin, head of the department of legal Informatization and computer systems. Upon termination of training with the staff of the justices of the peace, the topical issues of optimization of the costs for mailings, the need to observe the code of ethics by the staff of magistrates' offices, the issues of material and technical support for the activities of magistrates, and the compliance with security requirements at court areas were discussed.